What is a video resume? The very name suggests an answer but actually it is different from a regular resume send by mail to a potential employer. Video does not replace traditional CV completely and does not repeat it in details. It complements the paper work through liveliness, dynamics and the ‘feel’ of a person applying for a position. Video resumes are a relatively new trend since the technology allowing easy mass production and distribution of this content has also appeared relatively recently. In the 1990s a video player was hardly a necessary device in HR headquarters, and today laptops and smartphones are extensions of our hands and ourselves, so video resume era has arrived. Popularity of video resumes is a relative issue. They may not be accepted by employers fearing discrimination claims (like selecting employees by their appearances and acting talents instead of job skills). They are also irrelevant in fields where hard skills and experiences are everything and entertaining and self-presenting skills are worth little (take construction, engineering, machine manufacturing and so on). But for companies that work with high tech, engage with wide audience on regular basis and have constant need for creativity and emotional intelligence video resumes are welcomed addition to a traditional application kit. Resumes and cover letters tend to be formal and standard looking. On the one hand, it facilitates reading and comprehending, but on the other hand it does not catch the personality and the ‘vibe’ of an applicant. And these are the particular features that are necessary for PR people, sales managers, creators, actors, all those who work with people. So a video resume can cast a light on the applicant whose resume is similar to a dozen of others but who is really carved for this very position. If you wonder whether to do a video resume, consider following several points. Videos are not the same as paper documents (yes, it is obvious but the differences run deeper that they seem). Videos require a lot more preparation and resources, and they take more than just typing the paper in your overalls or pajamas with mug of coffee by your side. When you are a person who applies for video editing position. When you have no one to show it to and ask for their open opinion (optional, but it really works). Nevertheless, you believe that video resume with strengthen your chances at getting the job. How to go about it and not to look like a Chewbacca in your formal self-presentation shot? Be concise. Say only the most important things and something nice about the place you want to work at, and how you want to help them fare even better. Take formal and professional approach. Find a neutral quiet place and dress formally or semi formally, do not get overly emotional. It is like a semi-formal interview, not a YouTube video contest. Have a clear scrip written in advance. You need to know what you will say next and what your overall message is. You may not read it word by word, but essential points have to be visual in front of you so that you did not lose the thread of your talk. Tell your story. It is about you, not about places you worked at or things you did. So talk in your own name, like ‘I worked there and learned a lot from people’, or ‘I did this and this and mastered some kind of tricky software’, or ‘I saw this as an opportunity to innovate and came up with a solution that helped us cut the waste of materials’, or even ‘I boosted sales at a coffee shop by giving people positive emotions, so my mornings were really busy back there as customers flocked for their cuppas and good start of the day’. Give specific details about your professional self. Tell what exactly you accomplished, use figures, measurements, some key data to show how useful you were there. Invent some call to action to engage your audience. It is not about urging managers to hire you right away, it is about inviting them to see your LinkedIn page or view portfolio, or reaching out to hear from your previous employers (if it speaks to your benefit). Keep time limits. Videos in the range of 30 to 60 seconds are the most likely to be viewed to the end, so try to fit everything you wanna say into this timeframe. Take care of technical side of the video making. Production tools like good light, sound and background all play to your benefit – or against you, if they are bad. So take care of all mentioned in advance, ensure that you are well seen and well heard, and then hit ‘Record’. Seek feedback from people you trust. Writing and making videos are essentially different activities, and while words are seen as neutral in their impact, at least in resumes, videos betray more about you that you think. So ask friends or family to view the video and judge it, not just say something to flatter you. Their feedback will be very mild, so if they say something about less emotions and more business talk, a little bit more, then you should pump up the job-related aspect of your video a good deal more, obviously. Types of videos you can make are also different, thanx to influx of new tech and tools. Real life videos are cool if you feel confident about how you talk and sit in front of camera – and other people, for that matter. But if you don’t, it is not the case to drop the idea altogether. Animated videos made with use of special services have become the next big thing, and they allow doing fun and easily digestible self-presentations without suffering the stage fright. You can find templates and pick a character to represent you, customize it to match your appearance and make a video without ever looking into the camera. Do not discount this opportunity. 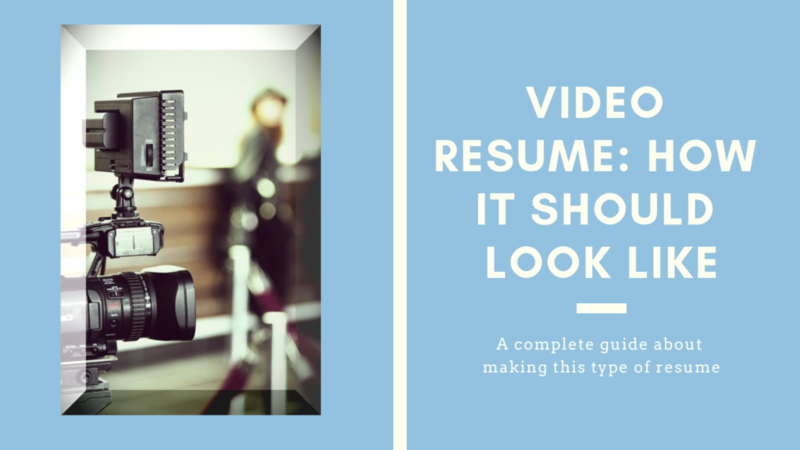 We have listed plenty of tips and tricks for making a decent and viewable video resume but there are some grave do not’s that you should keep in mind to avoid unexpected backlash. If you plan to use web platform to upload your video, do not opt for YouTube. Its algorithms may place the most unfitting suggested video next to yours or show some inappropriate ad. Besides, your long forgotten classmate may come and post some doubtful jokes about your common school years, and it is not the thing you want your potential employer to see. Use Wistia and Vimeo services instead since they are business oriented and often visited by your target audience. It is a safer and more practical option from many viewpoints. Never introduce aspects of your private life into this professional piece. Your family life is not of much interest to recruiting managers and an image of a perfect family/couple is not a sign of a reliable employee. So keep your dearest ones away from this publicity. And finally, never do things you will regret, like showing irrelevant skills or taking weird actions to show off your creativity. As a startup owner you can do it to attract workers by your informal approach, but as an applicant you have to be careful and selective so that you showed only skills you want to be noticed and appreciated at your new workplace. Video resume is not a tool of new job search only. When done properly, it can accomplish much more. You can send a small ‘thank you’ video as a follow up letter after being invited to an interview. You can ask for promotion within your current company with help of a video where you explain how you help your company every day. You may introduce yourself to a new team by making and circulating in internal network a brief video that explains who you are. It is better than meeting every team member and doing explanation anew every time. You may post a good resume video on one of recommended resources without direct purpose of finding new job immediately and see if anyone will reach out and offers you something interesting. And one last thought: a video interview is not a complete analogue of a paper resume. It is a good support for it, yes, but not a total substitute. So take care to create a really professional written resume (you will find plenty of useful tips and example on our site) and then take a chance at doing this little Spielberg thing. Now light! Camera! Action! Jane Williams – HR consultant and writer at Resumesarea.com.